STOCKHOLM – Sweden’s foreign minister held what she called “good and constructive” talks with her North Korean counterpart on Friday amid growing speculation about a possible meeting in the Scandinavian country between President Donald Trump and North Korean leader Kim Jong Un. 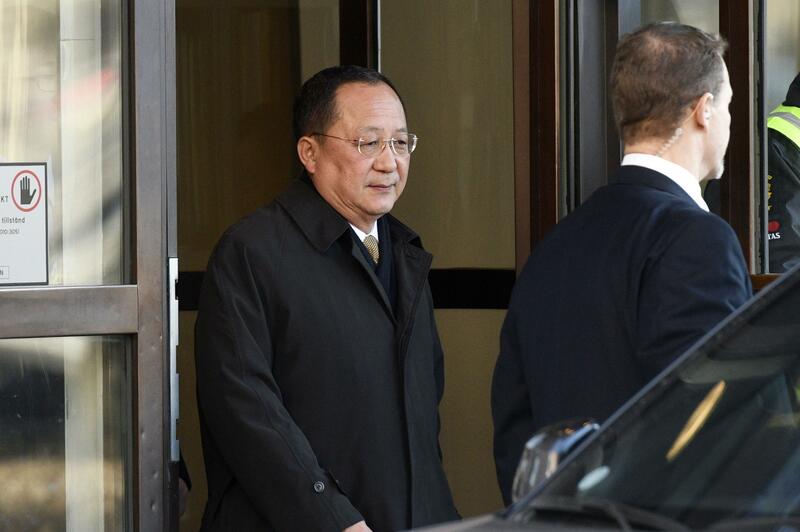 Foreign Minister Margot Wallstrom refused to comment on whether she and North Korea’s Ri Yong Ho discussed a Trump-Kim meeting in brief comments as she left the Stockholm villa where the meeting took place. The building is close to the embassies of South Korea and the United States. “We’ll see what happens next,” Wallstrom said. Ri has not made any public comment during a visit to Stockholm that started late Thursday. He also held a brief meeting earlier Friday with Swedish Prime Minister Stefan Lofven. Wallstrom earlier said Sweden is hoping that “we can use our role and also our contacts,” but stressed that it is up to the countries concerned to decide “which way we are going.” She said that “we value this opportunity to arrange a meeting,” though she didn’t specify what she meant. Lofven, speaking at a news conference with German Chancellor Angela Merkel in Berlin, did not answer directly whether his country had U.S. support to organize talks with North Korea. “We have always said we want to be a mediator that facilitates this process,” he said Friday. Trump has agreed to meet Kim by May. So far, North Korea has yet to comment publicly on what it hopes to gain from the talks. Sweden has been rumored as a possible site for the summit, though a truce village on the South Korean side of the Demilitarized Zone between the Koreas is seen as more likely. Ri’s visit to Stockholm, where he once served as a diplomat at the North Korean Embassy, has been shrouded in secrecy. The Swedish foreign ministry said ahead of his visit that talks would focus on “Sweden’s consular responsibilities as a protecting power for the United States, Canada and Australia” but also would address the security situation on the Korean Peninsula. Sweden has had diplomatic relations with North Korea since 1973 and is one of few Western countries with an embassy in Pyongyang. It provides consular services for the United States in North Korea. The trip by Ri is being closely watched because a huge amount of preparation needs to be done before the summit. Senior South Korean officials who traveled to the North Korean capital of Pyongyang this month and met with Kim say he is willing to discuss the North’s nuclear weapons program. That could suggest a potential breakthrough, or a fallback to the North’s longstanding position that it’s willing to get rid of its nuclear weapons if the U.S. guarantees its safety. Published: March 16, 2018, 9:52 a.m.